There’s almost no need for me to try out the recipes from Leah Schapira and Victoria Dwek anymore. Their Made Easy cookbooks are “triple-tested” and I’ve reviewed enough of them to know that the recipes will result in delicious meals. But, an excuse to try a new dish, especially a new dessert – I just can’t pass that up. 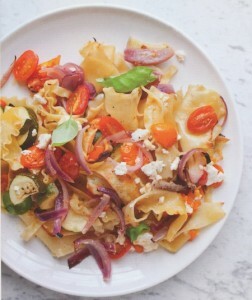 This time, using Dairy Made Easy, which was released, appropriately, just before Shavuot, I made the sunflower salad, baked roasted veggie pasta and lemon curd ice cream, but there are other salads, pastas and desserts, as well as soups, appies, pizzas and breakfasts. While Schapira and Dwek favor more packaged/frozen ingredients than I prefer, and a little more salt and sugar, I find their recipes amenable to adaptation and feel completely at ease with replacing, for example, frozen cauliflower with fresh, and using less/more of almost anything. Even if the consistency or look isn’t quite as nice, the taste is every bit as good. In a large bowl, combine lettuce, mango and red onion. Set aside. Prepare the dressing. In a small bowl, use a fork to mash goat cheese with olive oil, vinegar and Italian seasoning. You can also use a mini chopper for a smoother consistency. Prepare the brittle. Melt butter in a sauté pan over medium heat. Add sunflower seeds and toast for 30-60 seconds. Remove from pan and set aside. Add sugar to the pan and stir constantly until sugar is melted, about three minutes. It should be brown and completely smooth. Stir in sunflower seeds, pour into a thin layer onto a sheet of parchment paper and flatten as much as possible. Let harden. Chop into small bits, using a mini chopper or the bottom of a can. Toss salad with dressing. Top with sunflower brittle. Makes four servings. Preheat oven to 400°F. In a nine-by-13-inch pan, combine cherry tomatoes, red onions and zucchini. (More veggies can be added to the mix; red peppers substituted for the tomatoes.) Toss with olive oil and garlic powder. Bake for 30 minutes, stirring occasionally. Add pasta to vegetables and mix well. Season with salt and pepper. Preheat oven to broil and broil for 10 minutes, stirring after five minutes. Add feta cheese and basil; stir to combine (the heat will melt the cheese). Serve hot or at room temperature. Makes eight servings. 1. Crumble piecrust (which can be made using graham cracker crumbs or crushed tea biscuits mixed with some melted butter) and sprinkle crumbs into the bottom of individual serving dishes, or one large serving dish. Set aside. 2. Combine egg yolks, lemon juice, zest and sugar over a double boiler. Cook, whisking constantly, until thickened, six to eight minutes. Let cool. 3. In the bowl of an electric mixer, beat cream until stiff. Gently fold two-thirds of the lemon curd into the cream, a little at a time. It’s not a problem if there are swirls of yellow in the mixture. Pipe or spoon over crumbled crust. 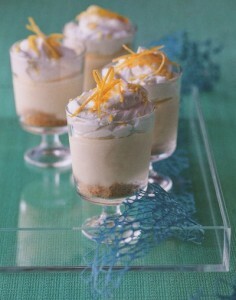 Drizzle with remaining lemon curd. Freeze until ready to serve. Makes eight to 10 servings.